11 July is Day of Archaeology. This day was founded after president of World Archaeological Congress appealed to UNESCO in 2008. 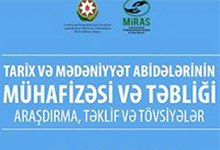 MIRAS Social Organization in Support of Studying of Cultural Heritage intends to arrange “Natural Pearls” photo exhibition among the schoolchildren dedicated to 5 June World Environment Day. MIRAS Social Organization in Support of Studying of Cultural Heritage held a meeting on 5 May 2014 with participation of its members. 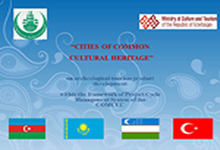 The staff of MIRAS Social Organization in Support of Studying of Cultural Heritage had been in Chiyni, Gegeli and Ulguj villages of Agsu region on 19-21 April, 2014. The purpose was holding meetings with representatives of local communes of villages and simultaneously monitoring and study of ecological and ethnographical situation within the new project of the organization. The project won category C and implemented with financial support of Azerbaijan Youth Foundation under the President of the Republic of Azerbaijan, is co-arranged by MIRAS Social Organization in Support of Studying of Cultural Heritage and “V.S. Training Center” Psychological Training Center. So, with creating opportunity for them to gain new vacation it is intended to promote chronicle of our national heritage. On 6-8th April, 2014 II International Symposium of Turkic Arts, History and Folklore was co-organized in capital city of Bosnia and Herzegovina, Sarajevo by Turkish Handicraft Research and Application Center of Selçuk University of Turkey, MIRAS Social Organization in Support of Studying of Cultural Heritage and International University of Sarajevo. More than 50 scholars from different scientific institutions of Turkey, Azerbaijan, Bosnia and Herzegovina, Macedonia and Iran made interesting reports. On 22-26 March, 2014 delegation of teachers and students of ICARUS Vocational Tourism College of Georgia got acquainted with cultural heritage monuments and tourism objects in Azerbaijan co-organized by MIRAS Social Organization in Support of Studying of Cultural Heritage, Heritage Travel Tour Company, Golden Travel Georgia Tour Company and Georgia for Friends Association. On 25th February, 2014 presentation ceremony of web-portals 26FEVRAL.AZ and 26FEBRUARY.AZ within the framework of the project realized with MIRAS Social Organization with IMAGE Company was held.